First machine gun was invented in USA by Hiram Maxim in 1883 and patented two years later. First wars Maxim`s MGs was taken into was colonial war in South Africa and Russia-Japan war (1904-1905). During WW 1 all sides used many machineguns,IWC Replica Watches both heavy (on wheels or tripods) and ligth (on bipods). After WW1 MGs become a standart issue as a squad weapons for ground and anti-aircraft warfare. Most widely used MGs were Maxims (in many modifications), Brownings M1919, Hotchkiss. Between two World Wars first appeared large caliber MGs (as a rule, its caliber was .50", or 12.7mm). Best examples - Belgian/American Browning M2 and Soviet DShK-12.7. 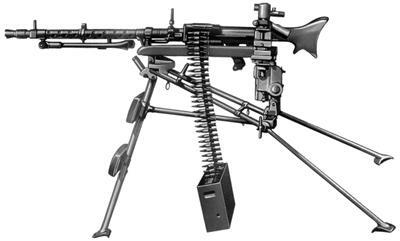 During WW2 Germans developed first mass "universal" MG (Mg42, later - Mg43), which can be used as a "ligth" MG on bipod or as a "heavy" one on tripod agains ground or air targets. This MGs set the trend, so almost all modern "medium" MGs such as Belgian MAG, American M60, Russian PKM may be used on bipod or tripod, as needed. Today the main role of all MGs is to provide sustained firepower for troops against enemy troops and unarmored targets. Heavy (.50/12.7mm) MGs can deal with lightly armored targets such as APCs, recon vehicles, helicopters. Almost every infantry squad in the world has at least one light MG. Russian squad usually equipped with one RPK-74 MG, US Army squad - with two M249 SAWs. Medium MGs usually are installed on vehicles (APCs, Jeeps, tanks) and used in infantry on ground mounts on troop and company level. Heavy MG are sometimes used as anti-aircraft weapons on tanks, main weapons on APCs and recon veichles and company level support weapons in infantry. Almost all heavy and medium MGs, and many light ones, have quick interchangeable barrels. Usually every MG comes from factory with one or two spare barrels, wich may be changed in battle environment within seconds. This feature provides ability to sustain intensive fire for longer time while one barrel is being used, the spare one can be cooled - intensive heating during the fire can dramatically decrease accuracy and reduce the lifetime of the barrel. The feeding systen of almost all medium and heavy MGs is build around belted (or linked) ammunition. Early belts were made from textile, modern belts are made from metal. Metal belts may be "desintegrated" or non-desintegrated. In the desintegrated belt the metal links are linked ty each other by the cartridge. When feeding system of the MG removes cartridge to feed the MG, links fall apart, thus "desintegrate" the single belt into the links. In non-desintegrated belts links are connected by the means of special details, and belts remains "one piece" even when all cartridges are removed. Usual belt capacity for heavy MG is 50-100 rds, for medium and light ones - 100-250 rds. Light MG often employs the magazine feeding system, using the standard "assault-rifle" style box magazines for 30-45 rounds each or hi-capacity drum or dual drum (Beta-C and others) magazines for 50-100 rounds each. In light MGs, made from assault rifles, magazines usually exchangeable between LMG and assault rifle. Good examples are AK and RPK Russian, Steyr AUG Austrian and L85/L86 British systems. Some light MGs such as FN Minimi/M249 are dual-feed and can use belts or box magazines without any modifications. Please Help us to keep this site Free by Donating.